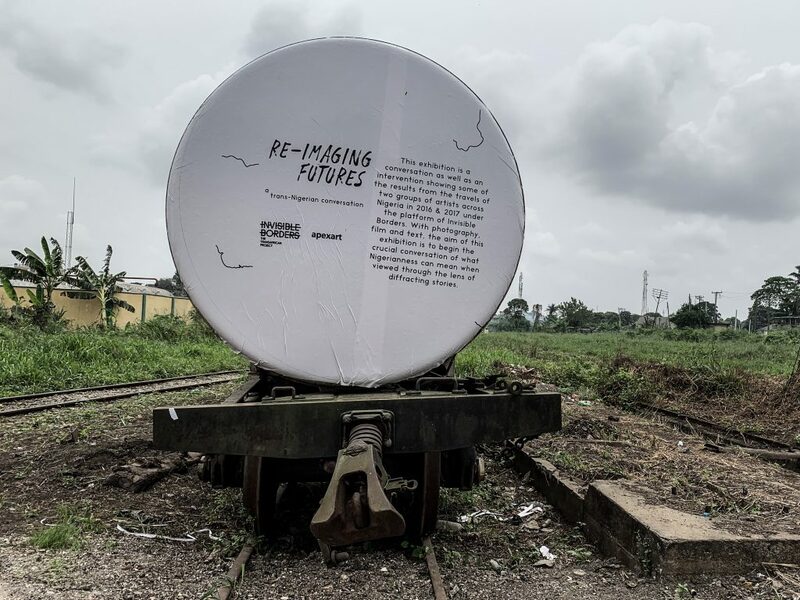 Locating the exact site of Re-imaging Futures: A Trans-Nigerian Conversation, an exhibition organised by Innocent Ekejiuba and Yinka Elujoba of Invisible Borders at the Nigerian Railway Corporation yard, was a bit of a challenge. On entering the yard through the main gate, I saw no signs of an ongoing exhibition. Confused, I proceeded to ask people around, but kept getting the same response, “This is a big compound, where exactly are you going?” Eventually, I managed to get appropriate directions after showing pictures of the exhibition which had opened the day before. But, the question I’d been asked repeatedly during my search for the venue remained with me: Where exactly am I going? I imagined my search as part of interacting with the exhibition. The search for the known, yet unknown. 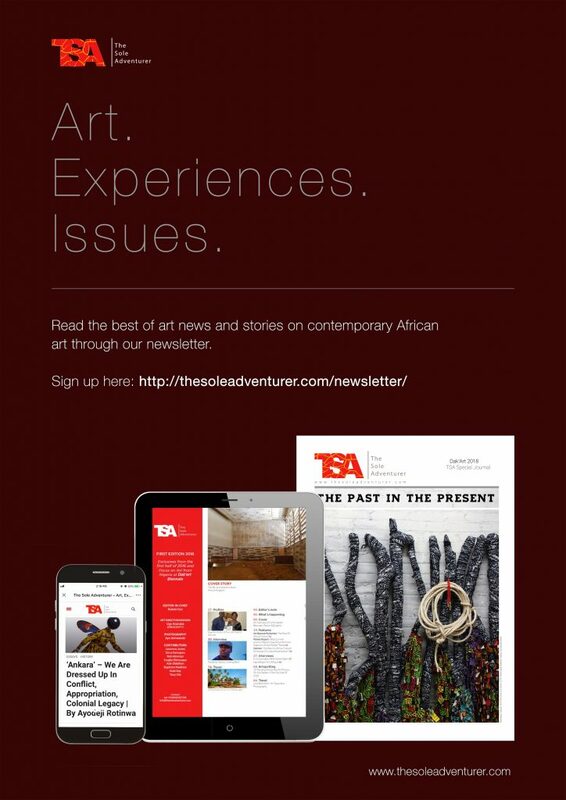 The exhibition, a result of a cross-country road trip, Borders Within, led by the Invisible Borders Trans-African Photographers Organisation with twelve Nigerian artists including writers, photographers, and filmmakers, featured thirty-nine photographs and several excerpts from essays developed by the artists during the course of the trip. These essays were published as chapbooks and displayed at the exhibition. The first thing that strikes a visitor at the exhibition is the textured materiality of the location. 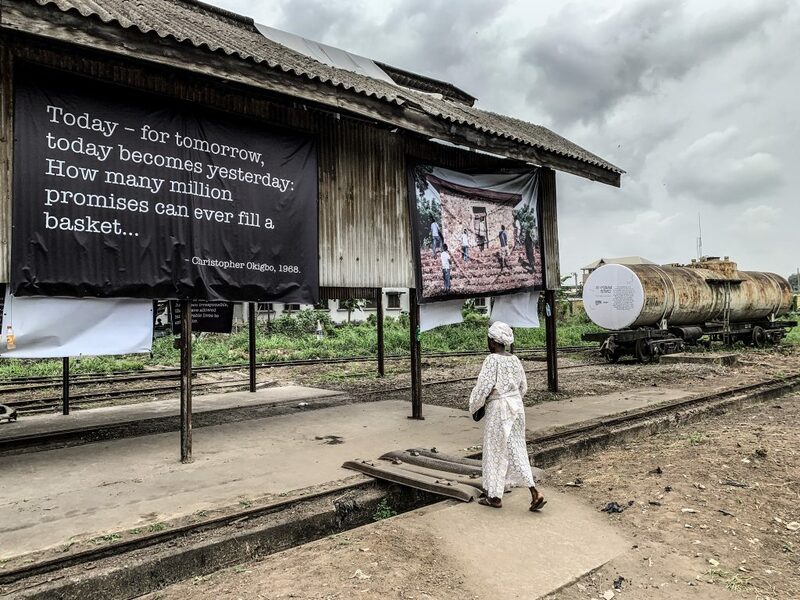 Situated within an abandoned railway complex complete with inoperable trains, defunct railway tracks, and dilapidated buildings reminiscent of colonial times, the exhibition served as a reference to a forgotten history of movement between spaces, an interaction between the past and the present in navigating possible futures. A space situated between layers of time. Perhaps, in exploring time as a non-linear concept, there is something to be found. Perhaps, the future can be negotiated. What does it mean to be Nigerian in relation to the map? 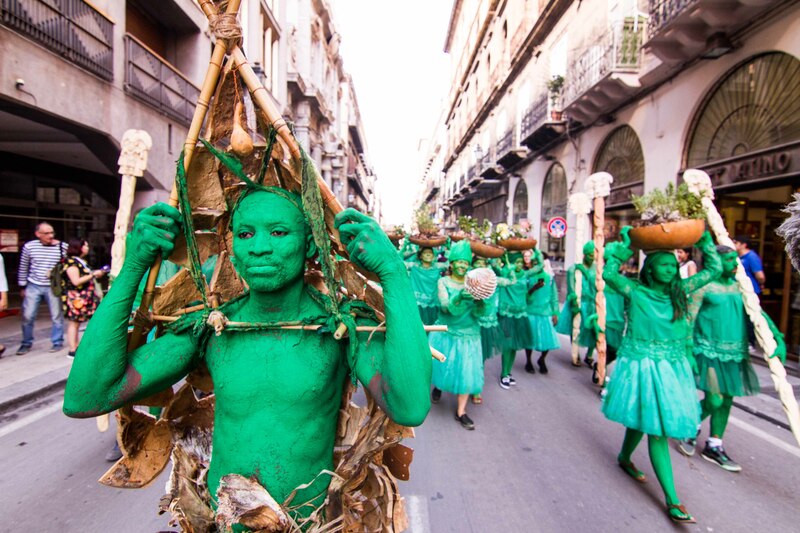 How do we navigate our ‘Nigerianness’: as individual parts of a whole, or as a forced collective? Keeping with Invisible Borders’ premise of movement, navigating the space and accessing the works on display required movement – vertical and horizontal. The works were arranged on two opposite walls, at varying heights, and with two parallel staircases leading from one level to the next. This demand for body engagement confronts the viewer with the notion of the negotiated space; the journey starts at the end of one wall to see what is displayed on the opposite wall – due to the narrowness of the space. Then, you will have to walk the length of that wall, make a U-turn and repeat walking down to view what is on the opposite side, and finally returning to the starting point, conscious of every step taken within the space. There were also works displayed on the outer part of the wall away from the designated entrance. I had come in through a different entrance, thus, I saw these works first. This presentation approach replicates in the works exhibited. According to the Oxford dictionary, the term re-imaging is the “action or process of forming a new or different mental or pictorial image”. So what is the role of these photographs in forming a new mental and pictorial image about a Nigeria that transcends mapped borders? Viewing the exhibition, one becomes aware of the employment of the human bodies as a site of inquiry into the reconstruction of identities. The photographs and texts go beyond documentation, the context in which they were created challenges the notion of Nigeria as a homogeneous construct, engaging and seeing through the eyes and bodies of others in confronting the immense topic of being Nigerian. There is certainly no artistic intervention that can hope to reveal a Nigeria that could have existed without the British. What seems possible, however, is to illuminate the multiple histories that continue to exist in a post-colony, through a mishmash of voices. A particularly striking photograph in the exhibition was that of a man wearing a military-style cap with the word VULTURE printed across the front. His right arm is raised to his head, thumb and index finger lightly gripping the visor almost in a form of greeting, reminiscent of tipping the hat, an acknowledgement of another’s existence. He wears a band around his arm, the Biafran flag and the words ‘BIAFRA’ and what appears to be ‘RISING’ printed across the band. There is an air of militancy and resistance prevalent in the image. The writing across the band brings to mind a history of civil war and unrest, of borders and marginalisation. On May 30, 1967, Colonel Odumegwu Ojukwu, military governor of the Eastern Region, declared the independence of the Republic of Biafra, following in part, intense persecution of the Igbos by Hausas in northern Nigeria. This declaration led to a bloody civil war between 1967 and 1970 resulting in the death of a huge number of Igbo people. Four decades later, there is still a clamour for an independent state, though in a much more repressed form. The photograph is direct and confrontational, mining contentious issues of boundary, ethnicity, history, and freedom. Accompanying the image was the text, “Vulture demands freedom to choose his own name, his country, his own destiny. Nigeria is a zoo, and it’s not working”’. Re-imaging Futures sets up a space for a dialogue between the past and the present, of lives lived and spaces inhabited. Here are bodies, landscapes, and buildings existing within borders, telling stories of time and place. Exploring these images from the trans-Nigerian trip opens up a conversation of negotiating and re-assessing identity. 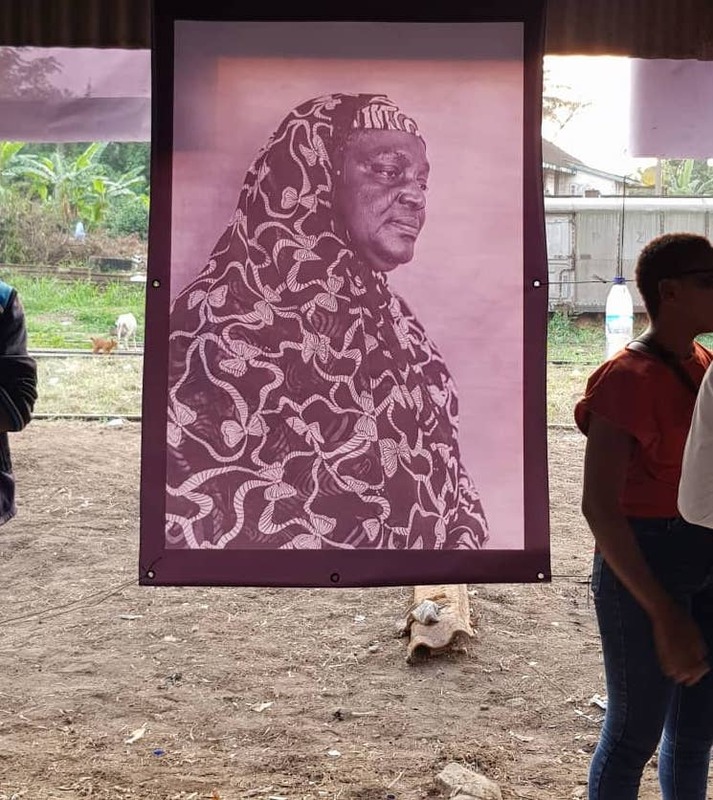 A text from the chapbooks describing the Borders Within trip reads, “There is certainly no artistic intervention that can hope to reveal a Nigeria that could have existed without the British. 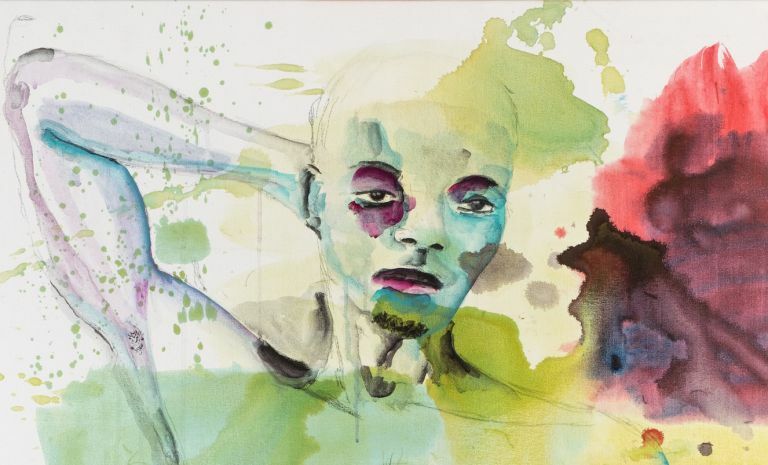 What seems possible, however, is to illuminate the multiple histories that continue to exist in a post-colony, through a mishmash of voices: ethnicities, religions, and visions of modernity.” An image by Emeka Okereke, the last one I will consider here, shows seven people, artists who participated in the road trip. They are shown standing, at varying heights on a staircase leading up to a rectangular building with a sloped roof, their back turned to the camera. 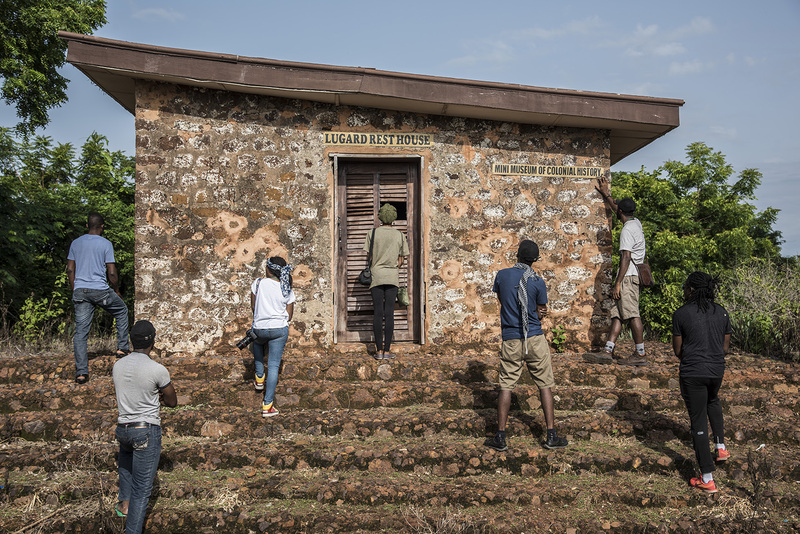 A closed door is situated in the middle of the building, the words ‘LUGARD REST HOUSE’ and ‘MINI MUSEUM OF COLONIAL HISTORY’ visible on the wall. The structure was built by Lord Lugard, the man responsible for the amalgamation of territories that is present-day Nigeria. The building, not unlike the location of the exhibition, serves as both a relic and a monument to a colonial presence in Nigeria, and it’s from there we have to start our journey. The initial question returns: Where exactly are we going?